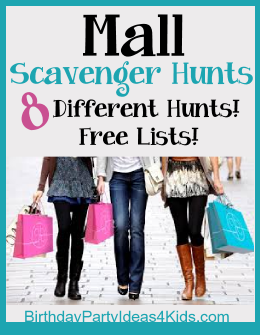 with free mall scavenger hunt lists Mall Scavenger Hunts are played similar to a regular scavenger hunt game. Players are set loose in the mall to find items or complete certain tasks from a list. Points are given for each item on the list. The first team to finish their list, make it back within the time limit and has the most points - wins. Directions, set up instructions and free item lists are included. Great for preteen and teen birthday parties. Teams must be polite and courteous to salespeople and shoppers at all times. Running, screaming or being rude is not allowed - teams are penalized for every occurrence. 1 point penalty for each minute teams are late Scoring is included in the free mall scavenger hunt lists - check the links next to each scavenger hunt. Free for non-commercial use - if posting on the web please use a link back to Birthday Party Ideas 4 Kids. Thank you! This mall scavenger hunt requires no money, video or digital camera. All the items on the Freebie Shopping Spree list are free. See how many free items the teams can acquire in a 1 - 2 hour time frame. The scavenger hunt list includes: credit card application, merchandise bag with handles, hanger, loose button, employment application, straw, ... 40 items in all! Think you know your local mall? You will after this fun mall scavenger hunt. Teams are required to find out unknown facts about the mall from a list of items. How many booths are really in the food court? How many buttons does the elevator have? How many stairs to the lower floor ... and many more. No money required! Teams search for items from a list that are only one color. Choose a color from your birthday party theme or choose two and let teams hunt for different colors of items from the same list. This scavenger hunt is best played with a video or digital camera, but if your mall won't allow pictures to be taken inside the stores it can be modified to be a cheap scavenger hunt. Hunt for presents and prizes for the birthday party or give each team $10.00 and have them purchase as many items as they can with it. Make sure to get receipts so the stores and amounts can be verified. This scavenger hunt is perfect for the 1 color theme party listed on kids and	tweens party theme ideas. ** Video and Digital cameras are not allowed in some malls - call and check with mall security first to make sure they are allowed inside the mall. No money is required for this scavenger hunt. Teams must find crazy items or complete tasks to finish their mall scavenger hunt list. All team members must be in each picture (except for photographer). Examples: Laying on a bench, with a salesman named Bob, trying to hide behind a tree. Give each team two separate lists or combine some of the items. We've listed over 40 ideas for this scavenger hunt with spaces to include your own ideas! ** Video and Digital cameras are not allowed in some malls - call and check with mall security first to make sure they are allowed inside the mall. Scavenger Hunt teams are to look for items that begin with each letter of the alphabet. Can be played from an alphabetical list, or teams can be given a list with just the letters of the alphabet and can choose what to use for their letters. Best played with a video or digital camera, but if your mall won't allow pictures to be taken inside the mall it can be modified to be a cheap scavenger hunt. Hunt for presents and prizes for the birthday party, or give each team $10.00 and have them purchase as many items as they can with it. Make sure to get receipts so the stores and amounts can be verified. Teams must find as many items as they can that have rainbows on them. This scavenger hunt can be modified to fit any character or symbol such as - stars, clouds, characters, sayings, etc. - even the birthday girls name! This scavenger hunt would fit easily into any birthday party theme. No list is needed - send teams out with video or digital cameras or give each team $10.00 and have them purchase as many items as they can with it. Make sure to get receipts so the stores and amounts can be verified. Or hunt for presents and prizes for the birthday party. No list needed ** Video and Digital cameras are not allowed in some malls - call and check with mall security first to make sure they are allowed inside the mall. Scavenger hunt teams must ask salespeople in the mall for items that the salespeople will give them for free. Items can be an old hanger, business card, pricing tag, trash - salespeople must sign a checklist so no two items can be obtained from one store. There are more then 40 items on the scavenger hunt list. 1. If you are having a slumber party / sleepover or a birthday party with games after the mall scavenger hunt here is a fun idea to add to a mall scavenger hunt. Instead of gifts ask guests to bring $5.00 - $10.00. Incorporate this money into the scavenger hunt and have one team buy prizes for games and the other team buy a present for the birthday girl. Add a few extra items to your list such as "cute jewelry", "makeup", "something cool", "something we all like" , etc. and give one team $20.00 to buy these items. Make sure this is the team that includes the birthday girl. What the team doesn't know is that these items will be used for prizes later in the evening. Give the other team - the team that does not include the Birthday Girl - $20.00 - $40.00 and tell them to buy a nice gift for the Birthday Girl. Tell them it's also a secret! 2. Every time teams cross paths with the birthday girl they must sing "Happy Birthday". 3. Make the last item on the list a hint as to where the meeting place is ... then hide there and have the teams try and find you. Do you have any ideas we can add to these mall scavenger hunts? If your tween or teen has any ideas - let us know! We are always looking for great tween and teen party theme ideas also. 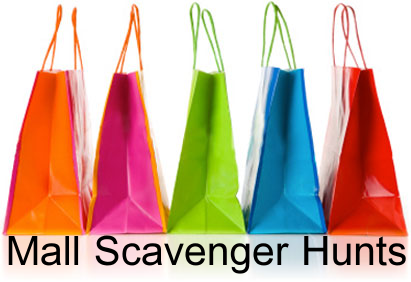 For more fun ideas to add to the Mall Scavenger Hunt see our Tween Party Games and Teenage party games pages.